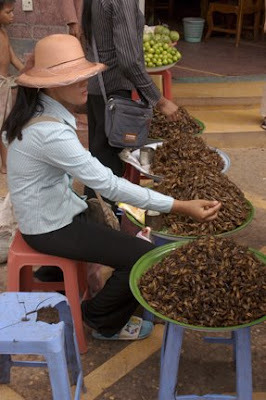 These crunchy crickets the Khmers are so wild about are about 2.5inches long, the females huge with eggs at the end of rainy season. 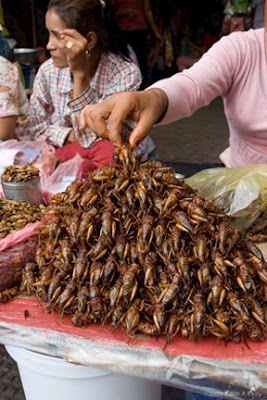 Crickets owe their place in the culinary landscape to the art of survival during the starvation period of the Khmer Rouge era. 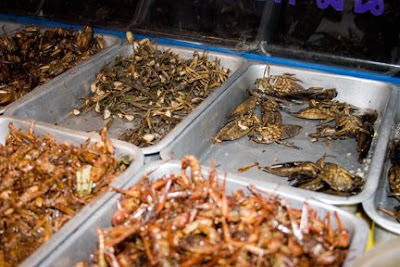 Today this delicacy has surged in popularity, creating a robust trade with neighboring countries, the heart of which is in Kampong Thom, a requisite stop between Phnom Penh and Siem Reap where they particularly thrive. At night fields light up with the bug-catching contraptions: a flourescent bulb to attract them is hung about 2m off the ground on a bamboo frame 2m wide, with sheets of plastic to catch them mid-flight, and a trough of water below for them to drop into and drown. A farmer investing in such a trap can net up to 10kg of the bugs. And remember this post? 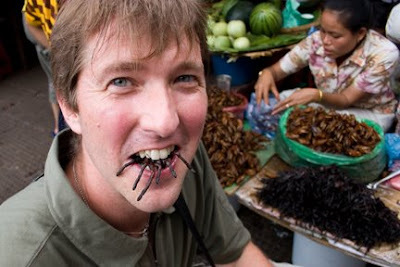 Today tarantulas are 1000riel each (25cents). Believed to contain medicinal properties for the heart and lungs, they're farmed in a small town called Skun, which is also in Kampong Thom province. The crispy legs aren't so objectionable, it's almost like a potato chip. 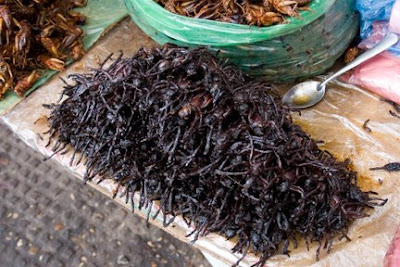 It's the rump that brings on the cringe-- this has a meatier texture than the cricket's torso, and has a nutty taste seasoned with garlic and lemongrass. A gastronomic adventure awaits the uncompromising palate!